Today is the birthday of James Watt, not the BrewDog co-founder, but the “Scottish inventor, mechanical engineer, and chemist who improved on Thomas Newcomen’s 1712 Newcomen steam engine with his Watt steam engine in 1781, which was fundamental to the changes brought by the Industrial Revolution in both his native Great Britain and the rest of the world. Watt attempted to commercialise his invention, but experienced great financial difficulties until he entered a partnership with Matthew Boulton in 1775. The new firm of Boulton and Watt was eventually highly successful and Watt became a wealthy man. In his retirement, Watt continued to develop new inventions though none was as significant as his steam engine work. He died in 1819 aged 83. A portrait of James Watt, by Carl Frederik von Breda, completed in 1792. Of course, from our perspective his most important contribution was to the industrial revolution, and specifically the improvement of brewery efficiency. 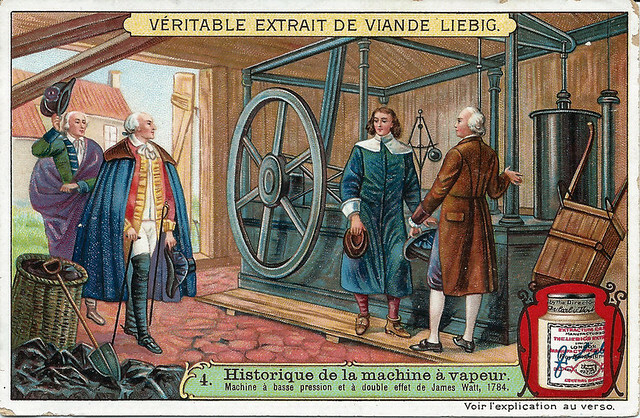 While Watt did not invent the steam engine, his improvements made it practical, especially in breweries. 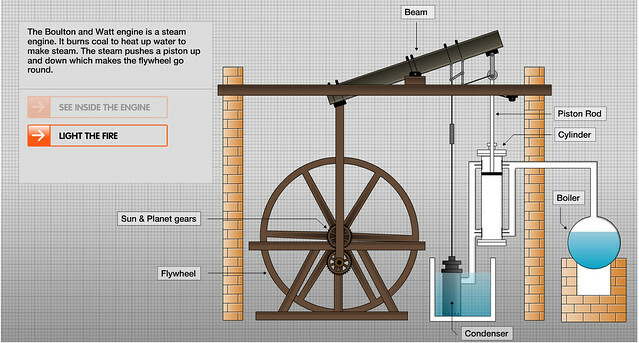 The Watt steam engine (alternatively known as the Boulton and Watt steam engine) was the first type of steam engine to make use of a separate condenser. It was a vacuum or “atmospheric” engine using steam at a pressure just above atmospheric to create a partial vacuum beneath the piston. The difference between atmospheric pressure above the piston and the partial vacuum below drove the piston down the cylinder. James Watt avoided the use of high pressure steam because of safety concerns. Watt’s design became synonymous with steam engines, due in no small part to his business partner, Matthew Boulton. 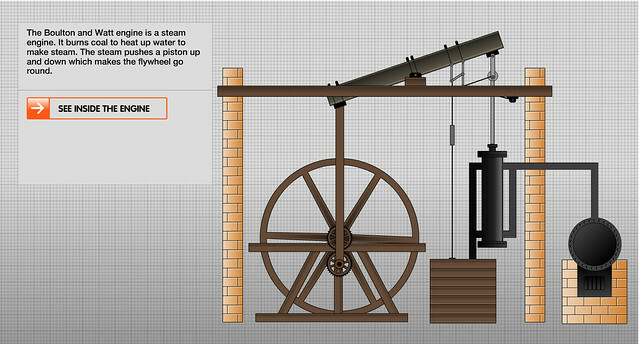 The Watt steam engine, developed sporadically from 1763 to 1775, was an improvement on the design of the Newcomen engine and was a key point in the Industrial Revolution. Watt’s two most important improvements were the separate condenser and rotary motion. The separate condenser, located external to the cylinder, condensed steam without cooling the piston and cylinder walls as did the internal spray in Newcomen’s engine. 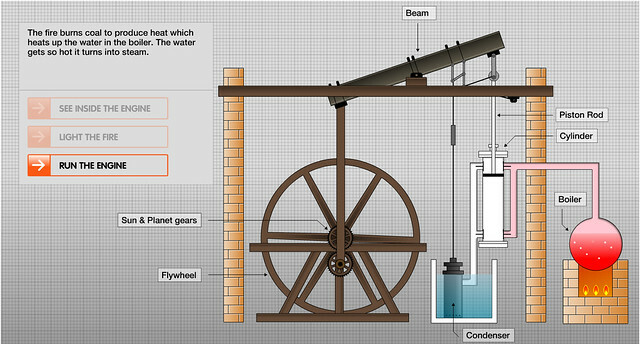 Watt’s engine’s efficiency was more than double that of the Newcomen engine. 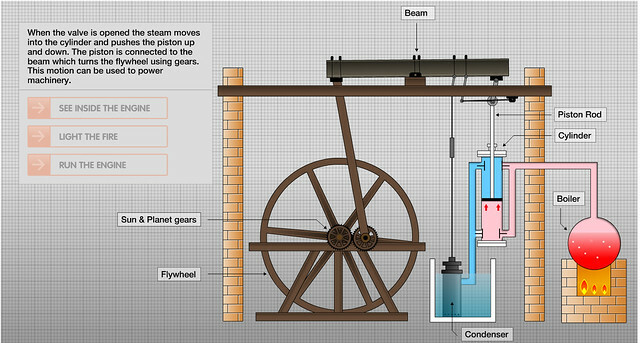 Rotary motion was more suitable for industrial power than the oscillating beam of Newcomen’s engine. Watt’s most famous steam engine was the one installed at the Whitbread Brewery in 1785, which was known as the Whitbread Engine. Today it’s located in the Powerhouse Museum in Sydney, Australia. 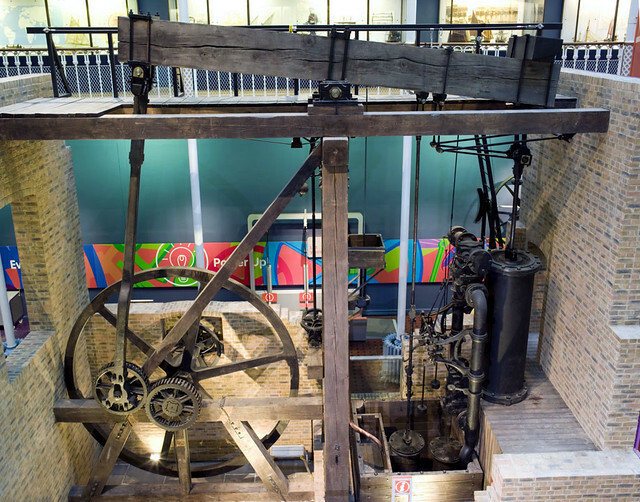 The Whitbread Engine preserved in the Powerhouse Museum in Sydney, Australia, built in 1785, is one of the first rotative steam engines ever built, and is the oldest surviving. A rotative engine is a type of beam engine where the reciprocating motion of the beam is converted to rotary motion, producing a continuous power source suitable for driving machinery. This engine was designed by the mechanical engineer James Watt, manufactured for the firm Boulton and Watt and originally installed in the Whitbread brewery in London, England. On decommissioning in 1887 it was sent to Australia’s Powerhouse Museum (then known as the Technological, Industrial and Sanitary Museum) and has since been restored to full working order. Installation of the Watt Steam Engine at Whitbread. The engine was ordered by Samuel Whitbread in 1784 to replace a horse wheel at the Chiswell Street premises of his London brewery. It was installed in 1785, the second steam engine to be installed in a brewery, and enabled Whitbread to become the largest brewer in Britain. The horse wheel was retained for many years, serving as a backup in case the steam engine broke down. The drive gear of the engine, still evident today, was connected to a series of wooden line shafts which drove machinery within the brewery. Connected machinery included rollers to crush malt; an Archimedes’ screw, that lifted the crushed malt into a hopper; a hoist, for lifting items into the building; a three-piston pump, for pumping beer; and a stirrer within a vat. There was also a reciprocating pump connected to the engine’s beam, used to pump water from a well to a tank on the roof of the brewery. In a marketing coup for both the brewer and the engine’s manufacturer, King George III and Queen Charlotte visited the brewery on 24 May 1787. The engine remained in service for 102 years, until 1887. The engine made its way to the Powerhouse Museum (then known as the Technological, Industrial and Sanitary Museum) through Archibald Liversidge, an English-born chemist, scientist and academic at the University of Sydney, who was a trustee of the museum. Liversidge was in London in 1887, at the time of the engine’s decommissioning, and when he heard that the engine was to be scrapped he asked whether it could be donated to the museum. Whitbread & Co agreed on condition that the engine be set up and used for educational purposes. Subsequently, the engine was dismantled and shipped to Sydney on the sailing ship Patriarch. For shipping purposes, the large flywheel was divided into two halves. While the flywheel’s rim could be unbolted, the hub with attached spokes had to be drilled through and rejoined after shipping. A shortage of funds meant the engine was kept in storage for several years. Eventually the engine was erected in its own engine house, behind the main building at the museum’s old Harris Street premises. During the 1920s or 1930s, an electric motor was added so that people could see the engine in motion. During the 1980s the Technology Restoration Society was formed in order to raise funds for the engine’s restoration. Restoration took place at the Museum’s Castle Hill site. During the restoration, some parts – including the piston – were replaced to preserve the original parts. The engine, restored to steaming condition, was installed in the new Powerhouse Museum in 1988. Today the engine is sometimes operated as part of the Museum’s Steam Revolution exhibition, steam being provided by the Museum’s central boiler. The engine has a 0.64 metres (25 in) diameter piston with a 1.8 metres (6 ft) long stroke, driven by a mean effective pressure of 70 kilopascals (10 psi). Its top speed is 20 revolutions per minute (rpm) of the flywheel. In the engine’s youth, it had a maximum power output of approximately 26 kilowatts (35 hp). [It underwent a series of alterations in 1795, converting it from single-acting to double-acting; it was alleged at the time that this conversion improved its power to 52 kilowatts (70 hp), but the Powerhouse Museum claims this is false. A centrifugal governor, which moderates the level of steam provided if the engine begins to overload was added some years after this, and beam and main driving rod, both originally of wood, were replaced in sand-cast iron. Apart from its age, the engine is notable in that it embodies the four innovations which made Boulton & Watt’s engines a significant driver of the Industrial Revolution. The first is a separate condenser, which increases the efficiency of the engine by allowing the main cylinder to remain hot at all times. The second is the parallel motion, which converts the up-and-down motion of the piston into the arcing motion of the beam, whilst maintaining a rigid connection. The rigid connection allowed the engine to be double-acting, meaning the piston could push as well as pull the beam. Third is the centrifugal governor, used to automatically regulate the speed of the engine. Finally the sun and planet gear convert the reciprocating motion of the beam into a rotating motion, which can be used to drive rotating machinery. 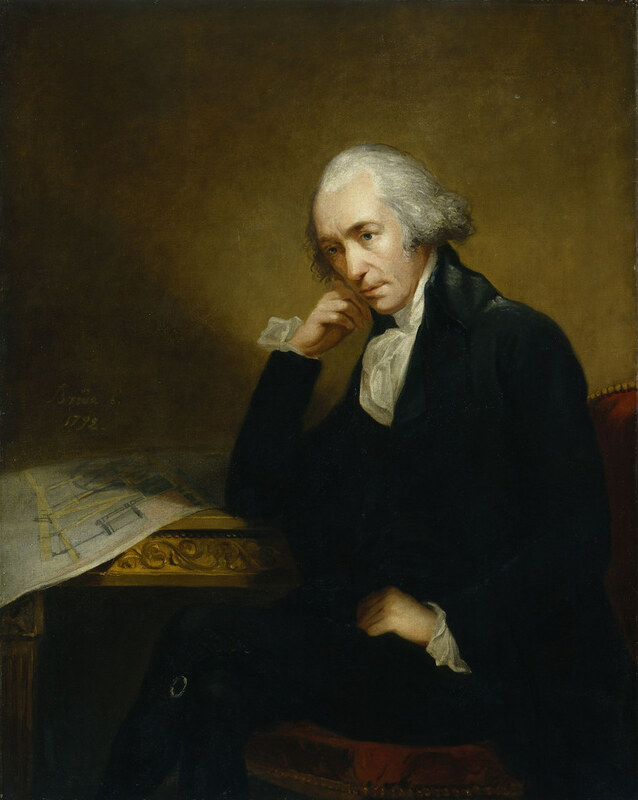 James Watt (1736-1819) was a prolific inventor, surveyor, instrument maker and engineer. His engines dramatically increased the power that could be generated through steam. 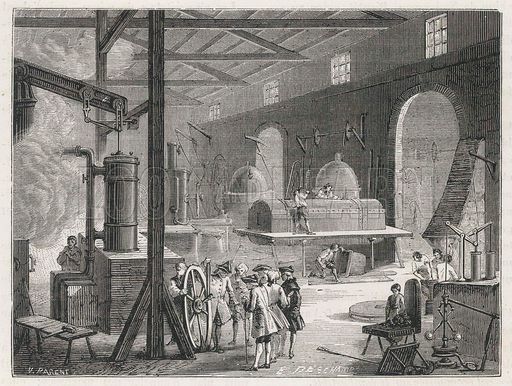 By entering into partnership with the Birmingham magnate Matthew Boulton in 1774, James Watt was able to channel the vast resource of Boulton’s Soho Foundry. Their partnership was so successful that the Boulton & Watt firm supplied engines and expertise to countries as far a field as Russia and Greece. After pumping water and grinding barley for almost eighty-seven years, the engine came out of service in 1883. 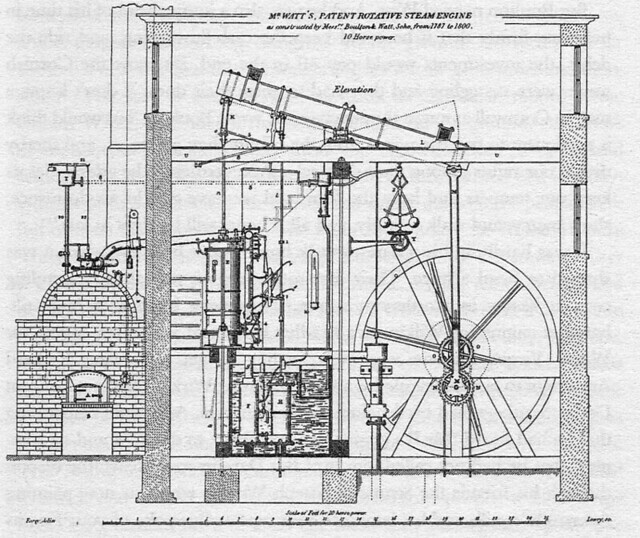 If you want to read more in-depth about Watt’s development of the steam engine, Chapter III of “The Development of the Modern Steam-Engine: James Watt and His Contemporaries” is online, and there’s also various links at Watt’s page at the Scottish Engineering Hall of Fame.